Jackie Hoppes married William Howard Weaver, son of Fred Weaver and Barbara Jean Detwiler. Patricia Coleman was born circa 1924 at Washington.1 She was the daughter of Dennis Coleman and Beatrice Katherine Houser. Albert Richard Coleman was born on 4 June 1933 at Washington. He was the son of Dennis Coleman and Beatrice Katherine Houser. Albert Richard Coleman died on 10 March 2002 at Castle Rock, Cowlitz Co., Washington, at age 68. SOURCE: Barbara Weaver letter May 1988. Julia Marcella Jindra was a Housewife. Her married name was Vrzal. The cause of death was acute cardiac failure. [S577] George Nestaval entry, birth, LeSueur County Courthouse, Le Center, Le Sueur Co., Minnesota. [S1789] George Nestaval, death n/a (n/a), unknown repository, unknown repository address. Hereinafter cited as Death Cert - Geroge Nestaval. Her married name was Kendall. Max and Helen had lived at 1560 Charles Ave., St. Paul, MN 55104. She lived at 571 Aldine St., #17, St. Paul, Ramsey Co., Minnesota. She lived in 1995 at 490 E. Lynnhurst Ave., #203, St. Paul, Ramsey Co., Minnesota; Address at time of her death. [S578] Helen Marie Nestaval entry, birth, LeSueur County Courthouse, Le Center, Le Sueur Co., Minnesota. [S579] Interview with Helen M. (Nestaval) Kendall (Minnesota), by Steven Harn Redman. Steven Harn Redman (2633 N. 1600 E., Layton, Davis Co., UT). [S1544] Unknown article title, St Paul Pioneer Press, St. Paul, Minnesota, 03 Oct 1999. Hereinafter cited as St. Paul Pioneer Press. Alice Agnes Nestaval was born on 1 June 1907 at Montgomery, Le Sueur Co., Minnesota.2 She was the daughter of John Joseph Nestaval and Antonia M. Vitha. Alice Agnes Nestaval married Harold A. Guetzkow, son of Henry F. Guetzkow and Minnie M. (? ), circa 1937. Alice Agnes Nestaval died on 21 July 1976 at St. Paul, Ramsey Co., Minnesota, at age 69. She was buried at Forest Lawn Memorial Cemetery, St. Paul, Ramsey Co., Minnesota. Her married name was Guetzkow. Her Social Security Number was 477-09-8265, issued in Minnesota. [S580] Alice Agnes Nestaval entry, birth, LeSueur County Courthouse, Le Center, Le Sueur Co., Minnesota. George Stephen Nestaval was born on 26 February 1909 at Montgomery, Le Sueur Co., Minnesota.1 He was the son of John Joseph Nestaval and Antonia M. Vitha. George Stephen Nestaval married Permilia Marie Murray on 26 November 1938 at Dakota Co., Minnesota.2 George Stephen Nestaval died circa 1979 at St. Paul, Ramsey Co., Minnesota.3 He died on 22 June 1979 at St. John's Hospital, St. Paul, Ramsey Co., Minnesota, at age 70.4 He was buried on 25 June 1979 at Calvary Cemetery, St. Paul, Ramsey Co., Minnesota. George Stephen Nestaval was a Inspector for Great Northern Railroad. His Social Security Number was 701-12-1926. He lived in June 1979 at 1233 Niles Ave., St. Paul, Ramsey Co., Minnesota. The cause of death was Pulmonary insufficiency, Matastic Carcinoma of Colon. [S581] George Stephen Nestaval entry, birth, LeSueur County Courthouse, Le Center, Le Sueur Co., Minnesota. [S1970] Minnesota Official Marriage System, online http://www.mncounty.com/Modules/Certificates/Marriage/Default.aspx, Marriage Certificate 2700123. Hereinafter cited as Minnesota Official Marriage System. Ancestry.com. Minnesota Death Index, 1908-2002 (database on-line). Provo. Hereinafter cited as Minnesota Death Index, 1908-2002. He was never married. The cause of death was general Pintanitec?, secondary cause of death was acute appendicitis. An operation was performed on 13 Apr 1921. [S1579] Stanley Joseph Nestaval, Death Certificate 1921-MN-017758 (18 Apr 1921), Steven Harn Redman, 2633 N. 1600 E., Layton, Davis Co., UT. Hereinafter cited as Death Cert - Stanley J. Nestaval. [S582] Stanley Joseph Nestaval, Death unknown number, Family History Library:, 35 North West Temple St., Salt Lake City, Salt Lake Co., Utah. Edward John Nestaval was born on 13 August 1901 at Montgomery, Le Sueur Co., Minnesota.1 He was the son of John Joseph Nestaval and Antonia M. Vitha. Edward John Nestaval married Agnes Martha Szermeta, daughter of Paul John Szermeta and Frances Kordyiak, on 27 August 1927 at St. Adalbert's Church, St. Paul, Ramsey Co., Minnesota. Edward John Nestaval died on 24 January 1974 at St. Paul, Ramsey Co., Minnesota, at age 72. He was buried on 26 January 1974 at Forest Lawn Memorial Cemetery, St. Paul, Ramsey Co., Minnesota. In the 1920 Census, Edward was listed as a farm laborer. Died at Bethesda Hospital and was cremated. Edward John Nestaval was a Catholic. [S583] Edward John Nestaval entry, birth, LeSueur County Courthouse, Le Center, Le Sueur Co., Minnesota. Source Citation: Year: 1940; Census Place: St Paul, Ramsey, Minnesota; Roll: T627_1999; Page: 8A; Enumeration District: 90-174. [S1545] Maxmillian Kendall, unknown file number, SSDI - Max Kendall, unknown series (n.p. : n.pub.). Hereinafter cited as SSDI - Max Kendall. Description: This database is an index of deaths recorded by the State of Minnesota, USA, from 1908 to 2002. The index includes: name of the deceased, city and county of death, date of death, birth date, birthplace, mother's maiden name, and state file number.. Hereinafter cited as Minnesota Death Index, 1908-2002. 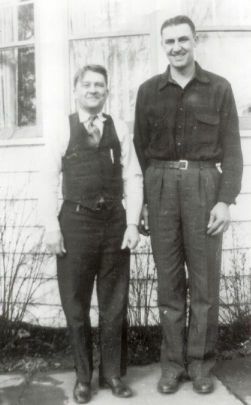 Harold A. Guetzkow was born circa 1908 at Minnesota. He was the son of Henry F. Guetzkow and Minnie M. (?) Harold A. Guetzkow married Alice Agnes Nestaval, daughter of John Joseph Nestaval and Antonia M. Vitha, circa 1937. Harold A. Guetzkow died on 2 December 1949 at Ramsey Co., Minnesota. He was buried at Elmhurst Cemetery, St. Paul, Ramsey Co., Minnesota; Find A Grave Memorial# 21721953, Plot: Block 38. Census 7 April 1930 St. Paul, Ramsey Co., Minnesota, listed as 22 years old and born in Minnesota. Permilia Marie Murray also went by the name of Pam. Her married name was Nestaval. Her Social Security Number was 476-24-2464 issued in Minnesota. [S584] Permilia Marie Murray, unknown file number, Social Security Death Index (b- 29Nov1914 d- Mar1979 St Paul, MN), unknown series (n.p. : n.pub.). Her married name was Nestaval. Her Social Security Number was 477-14-2681 issued in Minnesota. Agnes Martha Szermeta was a Catholic. [S585] Agnes Martha Szermeta, unknown file number, Social Security Death Index (b- 03Mar1906 d- Feb1988 St Paul, MN), unknown series (n.p. : n.pub.). [S586] Unknown article title, OBITUARY: unknown newspaper or issue date, 1988, unknown, 1988, ?. Hereinafter cited as unknown. Patricia Ann Guetzkow is the daughter of Harold A. Guetzkow and Alice Agnes Nestaval. Patricia Ann Guetzkow married Gregory John Johnson, son of Gunnard S. Johnson and Catherine E. Mitchell, on 29 August 1964 at Ramsey Co., Minnesota. Dorothy Mae Nestaval is the daughter of Edward John Nestaval and Agnes Martha Szermeta. Dorothy Mae Nestaval married Richard Roy Zarembinski on 23 September 1950. June Marie Nestaval is the daughter of Edward John Nestaval and Agnes Martha Szermeta. June Marie Nestaval married Harry Walter Wilcox on 15 May 1958. June Marie Nestaval married William Robert Bougie. Gloria Ann Nestaval is the daughter of Edward John Nestaval and Agnes Martha Szermeta. Gloria Ann Nestaval married Jack Womack Eddy on 23 November 1950. This database contains a statewide index of divorces filed in Minnesota between 1970 and 1995. Information that may be found in this database includes: husband's name and age, wife's name and age, divorce date, and divorce county. Her married name was Nicosia. SOURCE: Jamie L. Nestaval letter 24Feb1992. SOURCE: Jamie L. Nestaval letter 07Jun1992. Muriel Pauline Nestaval was a Catholic. She lived in 1992 at 442 White Bear Ave., N., St. Paul, Ramsey Co., Minnesota. Age 75 of St. Paul Passed away on March 15, 2015 Preceded in death by husband, Frank T. Nicosia. Survived by children Antoninette "Toni" (Mark) Anderson, Paula (Ken) Fennern, Frank (Laura) Nicosia; 6 grandchildren; 1 great grandchild. No visitation or service will be held, private family gathering. [S1674] MN Birth Index 1935-2002, online www.ancestry.com, 1939-MN-000277. Hereinafter cited as MN Birth Index 1935-2002. She lived in April 1945 at 582 Charles St., St. Paul, Ramsey Co., Minnesota.1 The cause of death was Tuberculosis and meningitis. [S1674] MN Birth Index 1935-2002, online www.ancestry.com, 1942-MN-051096. Hereinafter cited as MN Birth Index 1935-2002. Richard Stanley Nestaval was born on 18 June 1944 at St. Paul, Ramsey Co., Minnesota.1 He was the son of Edward John Nestaval and Agnes Martha Szermeta. Richard Stanley Nestaval married Judith Ann Hilgert, daughter of John Charles Hilgert and Nanette Marcella Berube, on 20 June 1964 at Minnesota. Richard Stanley Nestaval died on 5 February 2018 at Minnesota at age 73. SOURCE: Jamie L. Nestaval letter 24Feb1992. SOURCE: Jamie L. Nestaval letter 07Jun1992. Living in St. Paul, MN 1988, according to mother's obituary. He lived in 1988 at St. Paul, Ramsey Co., Minnesota. He lived in October 1997 at 11069 Oregon Curve, Minneapolis, Hennepin Co., Minnesota; Address obtained from 'Switchboard.com' on the internet Oct 1997. As of February 2004, Richard Stanley Nestaval lived at 9910 Drew Ave., S., Minneapolis, MN; Last updated on www.directory.bigbook.com on Feb 2004. Facebook page: https://www.facebook.com/profile.php?id=1656225266. Nestaval, Richard S. Age 73, of Eden Prairie, passed away February 5, 2018. Preceded in death by his parents, one brother and three sisters. Survived by wife, Judie; son, Bob (Mikell) Nestaval, daughter, Mikki (Greg) Johnson; grandchildren, Samantha (Patrick) Nestaval, Andee (Joe) Nestaval, Bre Murray, Nick Murray, Connor Johnson, Gabbie Nestaval, Brylea Johnson; one great-grandchild; sisters, Dorothy Zarembinski, Gloria Eddy, and Judy Nestaval; many other relatives, as well as friends. Funeral service Saturday 11 AM at St. Bonaventure Church, 901 E 90th St., Bloomington. Visitation one hour before service. Please donate memorials to the Autism Society of MN. St. Bonaventure Church, 952-854-4733. [S1674] MN Birth Index 1935-2002, online www.ancestry.com, 1944-MN-017040. Hereinafter cited as MN Birth Index 1935-2002. Judith Ann Nestaval is the daughter of Edward John Nestaval and Agnes Martha Szermeta. Judith Ann Nestaval married Arthur Sobiack on 21 May 1973. Judith Ann Nestaval and Arthur Sobiack were divorced on 11 December 1975 at Ramsey Co., Minnesota. Census 16 May 1885 Montgomery, Le Sueur Co., Minnesota, as 1 year old. M, #687, b. 22 May 1889, d. circa 1907? Jaroslav (Jerry) Nestaval was born on 22 May 1889 at Montgomery Twsp., Le Sueur Co., Minnesota.3 He was the son of Joseph Nestaval and Anna Factor. Jaroslav (Jerry) Nestaval died circa 1907? At Northern Minnesota. Census records lists name as Jaroslav Joseph Nestaval. SOURCE: Hal J. Nestaval letter 16Mar1992, says Jasolav Nestaval left home when 16 years old, and never heard of again. Census 12 June 1895 Montgomery, Le Sueur Co., Minnesota, listed as 6 years old. Buzena Nestaval was born in April 1897 at Montgomery, Le Sueur Co., Minnesota. She was the daughter of Joseph Nestaval and Anna Factor. Suzanne M. Winkler married male (?) Suzanne M. Winkler married Howard James Squires, son of Gordon Justus Squires and Stella Marie Vrzal, on 20 August 1977 at Hennepin Co., Minnesota. Anna Vrzal was born circa 1891 at Minnesota; CENSUS: 1905 MN, Goodhue Co., Montgomery, Amy listed as 14 years. She was the daughter of Mathias Vrzal and Mary Kubes. In 1920 Census taken in Jan1920, Anna listed as 29 years old.